Earn up to 2,750 reward points. Lightweight and efficient speaker pair. This compact, lightweight speaker pair is the perfect solution for numerous applications equipped with a 10" LF driver and a 1" HF driver. It is excellent for installment applications, as its cabinet material is lightweight and durable, and its grill will protect the speakers from the hazards of venue life. It is great for mobile applications as well, again because of its light weight and rugged construction. 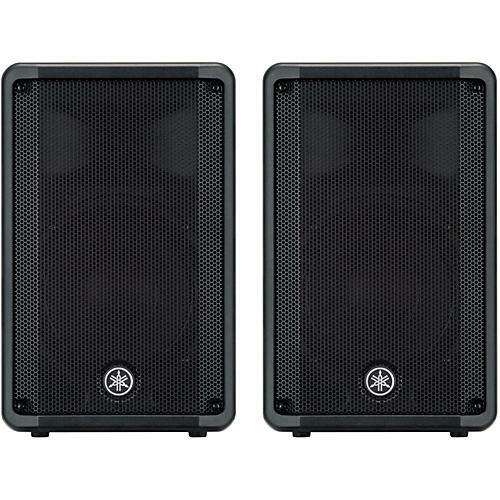 This item is a pair of CBR10s, ideal passive speakers for common small club audience sizes. The CBR Series was developed by adopting the extensive knowledge of speaker design and acoustic technologies that Yamaha has accrued over a long and storied history of making speakers of every kind. Combining a meticulous materials selection process, thorough customization of the audio components, and a fresh, innovative approach to speaker design, the engineering team's primary focus was to deliver high-power, high-definition sound in a highly portable and versatile design that is equally at home in front-of-house, floor monitoring, or rigged configurations. CBR Series speakers come equipped with carefully selected and customized transducers that feature a highly responsive woofer and a precise 2.5 compression driver (CBR15) or 2compression driver (CBR10 and CBR12), ensuring consistent high-definition sound with minimal distortion even at high output levels. Additionally, a newly designed wide-dispersion constant directivity horn minimizes the radiation pattern deterioration in oblique directions that more conventional horns are prone to, allowing sound to expand in a more rectangular pattern, evenly dispersing wide-frequency sound to the outer-most edges of the coverage area. Have you ever blown your speakers by cranking up the output levels beyond your speakers capabilities? CBR Series speakers employ a protection function that limits excessive input to the HF unit. This valuable protection circuit affords you worry-free operation of your speakers when you need them most. Combined with a highly responsive LF unit, CBR Series speakers reliably deliver clear, precise sound at any output level. CBR Series speakers feature a very compact, durable, and lightweight plastic cabinet equipped with newly designed, ergonomic handles that greatly minimize system transport and setup. In addition, all CBR models feature a sleek, steel front grille that seamlessly blends in with installation aesthetics while protecting the vital inner speaker components from environmental hazards. CBR Series speakers are equipped with one speakON jack and one 1/4" Phone jack that allow for fast and easy connectivity in both personal and professional environments. The CBR Series speakers feature an optimized 50 wedge angle for floor monitoring. In addition, the CBR12 and CBR15's symmetrical shape allows for effortless configuration of a mirror-mode floor monitoring system for a larger and more defined sweet spot. Order today and enjoy a high quality, low profile solution to your passive loudspeaker requirements.